“Dietary nucleosides and nucleotides perform a range of functions in our body. They play important role in the maintenance of mitochondrial function, differentiation of hematopoietic cells, strengthen the immune system, helps in small intestine growth and development, lipid metabolism etc. External supplementation of dietary nucleotides is a good regimen against mitochondrial dysfunction” (Sonkawade 2012). Nucleotides are able to help restore mitochondrial function and Arnaud was able to demonstrate that “dietary nucleotides promote earlier restoration of the ileal mitochondrial function after chronic diarrhea.” (2003). While nucleotides and RNA are prevalent in food sources, there may not be sufficient quantities in cases where more support is needed. An enhanced need for RNA nucleotides has been generally recognized for individuals undergoing surgery or trauma, burn injury, cancer, pneumonia and on respirators. However more recent literature supports a greater need for nucleotides in a much broader population base. 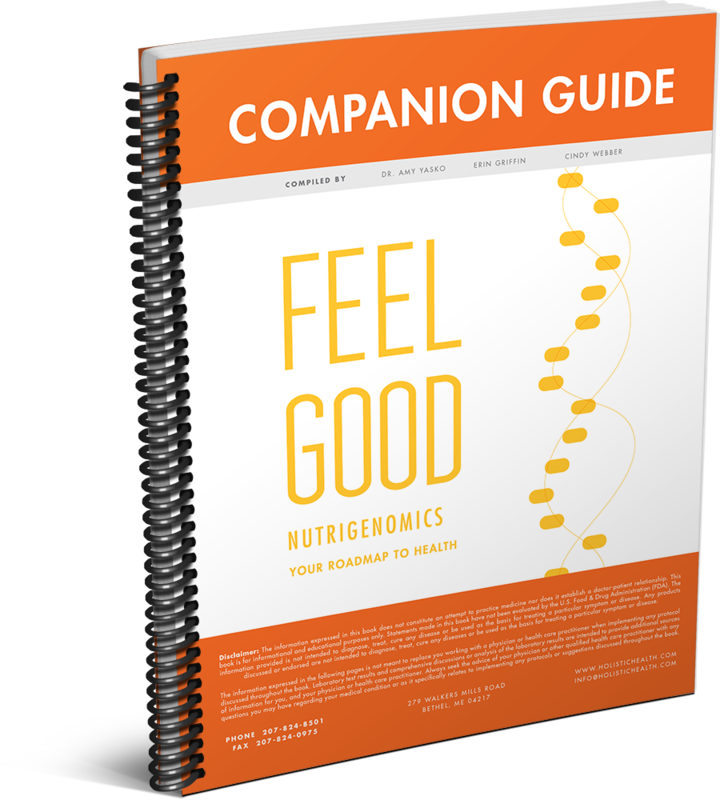 Those with gut absorption issues, those who have a greater need to produce new cells to counter injury, those under extreme stress (emotional, physical, structural) may all require more nucleotides than can be obtained or absorbed from food sources. Secretory IgA levels are measured on a number of biochemical stool tests and are often found to be out of balance for those with health issues. Often extremely low or high sIgA levels are noted along with imbalances in inflammatory markers, digestive issues and nonideal bacterial and fungal loads. sIgA is involved in first defense against cough and colds as well as protecting the gut lining. “Specific immunoglobulin A (IgA) level significantly increased in [mice] fed a nucleotide-supplemented diet compared with those fed a nucleotide-free control diet.” (Shinya, 2002). In addition, “Higher plasma immunoglobulin M and A concentrations were found in preterm infants fed nucleotide-supplemented formula.” (Martinez-Augustin, 1997). Conversely a lack of nucleotide support was found to have a negative impact on the immune system. “In mice and in humans, a nucleotide free diet significantly depressed IgM and IgG antibody production from spleen cells.” (Jyonochi, H. 1994). Li (2008) looked more comprehensively at the immune system in general, rather than only assessing antibody levels. Differential compositions and ratios of nucleotides were illustrated to have varying effects on the immune system (Li, 2008). Thus the diverse impacts of various nucleotide mixtures may reflect unique compositions of nucleotides as well as their respective ratios. Inflammatory mediators are key aspects of the immune system. Over production of these compounds plays a role in autoimmune conditions as well as inflammation. 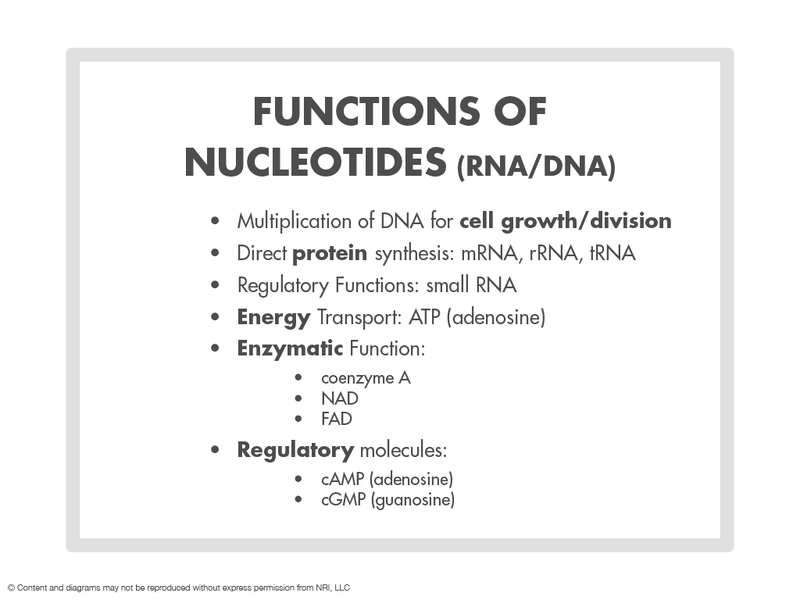 Nucleotides have a history of mitigating inflammation, including inflammation due to high levels of TNF alpha as well as C reactive protein, CRP (O’Flaherty, 1999). TNF alpha in particular is implicated in a range of health concerns including OCD behaviors, PANDAS, Rheumatoid arthritis and improper neural growth and signaling. A range of nucleotides have demonstrated the ability to decrease inflammation in general (Virag, 2001) and specific nucleotide support has been shown to aid in limiting TNF alpha based inflammation in particular (Hasko, 2004). Furthermore, nucleotides influence the levels of a range of cytokines including IL 2; these cytokines may play a role in the bodily response to microbes (Carver, 1994). Dietary nucleotides are also reported to influence cytokines IL10 (Holen, 2006) IL 6 and IL 8 as well as influencing lymphocyte maturation, activation and proliferation (Gil, 2002). “Rapidly proliferating tissues, such as the immune system or the intestine are not able to fulfil the needs of cell nucleotides … and they preferentially utilize the salvage pathway recovering nucleosides and nucleobases from blood and diet” (Gil, 2002). T cell function seems to be most vulnerable to lack of nucleotide support. “Notably, the responses are well established in a number of in vitro and animal studies and are believed to exert significant influences on Th1 immune response” (Hess, 2012). Additional studies support a balancing effect of RNA nucleotides on IgE mediated hypersensitivity and atopic allergic conditions. Dietary ribonucleotides helped to rebalance skewed TH1/TH2 responses back to a normal healthy ratio, suggesting that nucleotides may be useful for allergic conditions, allergic respiratory conditions as well as TH1/TH2 balance. “In summary, this study demonstrated that dietary nucleotides augmented Th1 responses … These results indicate that genetic predisposition to Th2 (atopic predisposition) can be modulated by dietary components in specific strains of mice. Our results also suggest that the mechanisms of this ribonucleotide action are associated with preferentially augmented Ag-specific production of IFN-g, a T1 cytokine” (Jyonochi ,2001). Previously, “In animal models, nucleotides have been shown to… improve delayed cutaneous hypersensitivity and alloantigen-induced lymphoproliferation…” (Pickering, 1998). Lack of nucleotides influence the manner in which the immune system responds to antigen. Rather than the appropriate activity of B cells, T helper cells and a balanced immune response, what may instead occur is a dysregulated response. It has been suggested that uncommitted T cells are suppressed in the absence of sufficient nucleotide support. 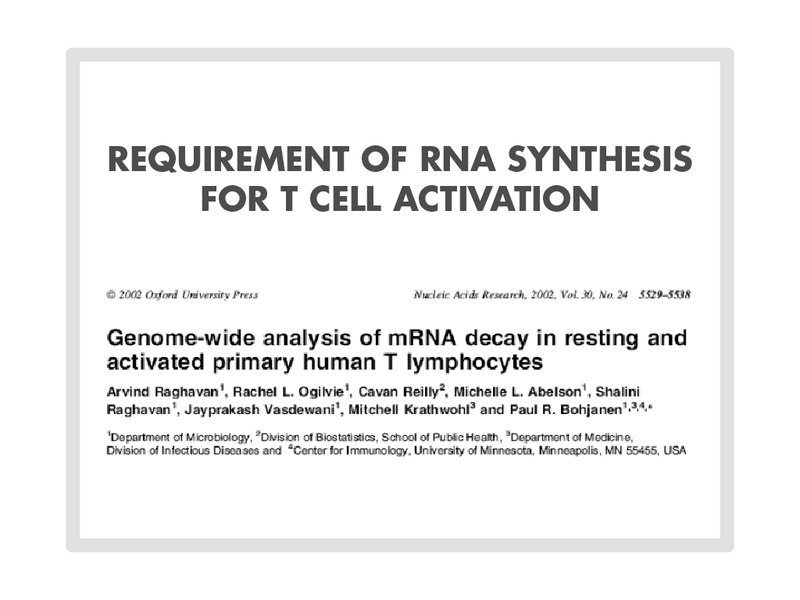 The addition of RNA or nucleotides may help to restore the differentiation of T cells to T helper cells that are needed for appropriate antibody responses. (Van Buren ,1994; Jyonouchi,1994). Dietary factors play a role in the antibody response of infants to immunization. Infants fed nucleotide supplemented formula showed more appropriate vaccination titer responses to HiB and Diptheria (Pickering,1998). Infants fed nucleotides had higher antibody titers to polio virus and in addition showed increases in more mature memory lymphocytes as part of that response. These results indicating more mature Hib and diphtheria antibody responses were consistent with observations from earlier studies, indicating immune benefits of nucleotide supplementation of infant formula. (Schaller, 2004). The safety and efficacy of using nucleotides from RNA were tested to assess the impact on antibody titers to pediatric vaccines, lymphocyte populations and the number of episodes of diarrhea. As compared to unsupplemented groups, those with RNA nucleotide supplementation showed improvements in antibody responses and less issues with diarrhea. “Available evidence suggests a positive benefit of RSFIs (ribonucleotide-supplemented infant formulae) on infant health without any risk.” (Gutierrez-Castrellon, 2007). The composite of these studies looking at the impact of nucleotides on antibody responses would suggest that nucleotide supplementation may have a positive effect on appropriate antibody responses to vaccines as well as the type of immune cell response that is elicited. In addition, numerous studies indicate that nucleotide blends help to support maturation of lymphocytes, aiding in responses to bacterial, viral and parasitic infections. Dietary nucleotides from RNA were assessed for their ability to alter immune cell phenotypes or function in the first year of life. Newborn term infants were either assigned to groups to receive RNA nucleotide support or to serve as controls. Ribonucleotide feeding changed subpopulations of T and natural killer (NK) cells. The nucleotide supported group had higher numbers and percentages of memory/effector,cytotoxic/suppressor T, and higher percentages of M/E helper T cells compared with the unsupplemented group. In addition the percentage of naïve, less mature lymphocytes was higher in the group without nucleotide support. “Ribonucleotide supplementation of infant formula supported increased T-cell maturation and affected immunoregulatory NK cell subsets” (Buck, 2004). Optimal immune function is important in mounting an appropriate response to bacterial, viral, fungal and parasitic infection without creating excessive inflammation or allergic reactions. “The absence of nucleotides decreases resistance to bacterial and fungal infections” (Hess,2012). This effect appears to be two fold in terms of addressing resistance to individual organisms (such as Staphylococcus, Candida, the parasite Cryptosporidium parvum, E.coli) as well as the promoting positive probiotic growth and enhancing immune function. 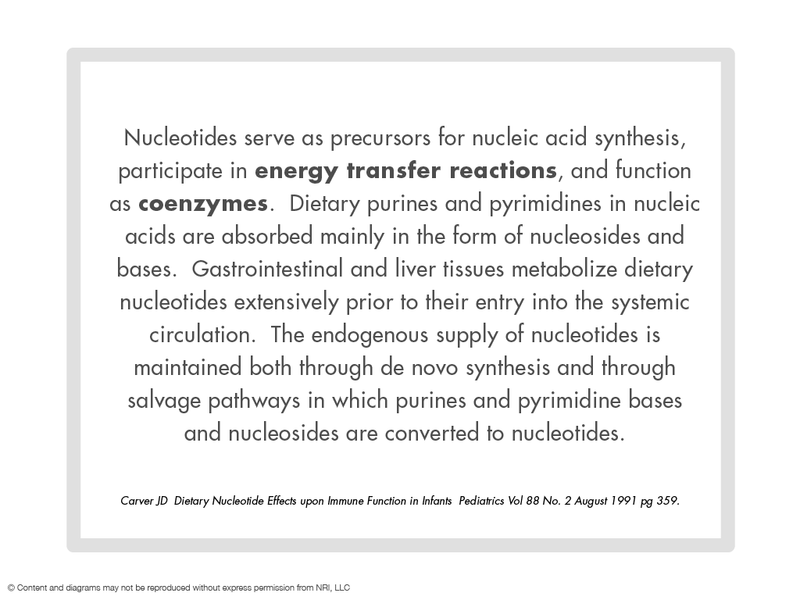 While the precise mechanism by which nucleotides support immunity is unclear, “provision of nucleotides to defined diets appears vital to maintain host resistance to bacterial challenge.” (Kulkarni, 1986). Nucleotides help to modulate the growth of beneficial probiotic strains of intestinal microbes (Uauy, 1994). Nucleotides appear to play multiple roles in supporting the intestinal environment, “In addition to promoting a rapid cell regeneration and increasing the production of intestinal disaccharidases, nucleotides also play an important role in the determination of the intestinal bacterial flora” (Norton, 2001).The addition of nucleotides increased the growth of Bifidobacterium and Lactobacilli, which are Dr.Amy’s preferred sources of normal flora (Tanaka,1980). Infants fed nucleotides has lower levels of nonideal flora such as Bacterioides and Prevotella, and higher levels of Bifidobacterium and Lactobacilli (Uauy, 1995). The differences in bacterial flora in the gut was attributed to the addition of nucleotides (Singhal, 2010). 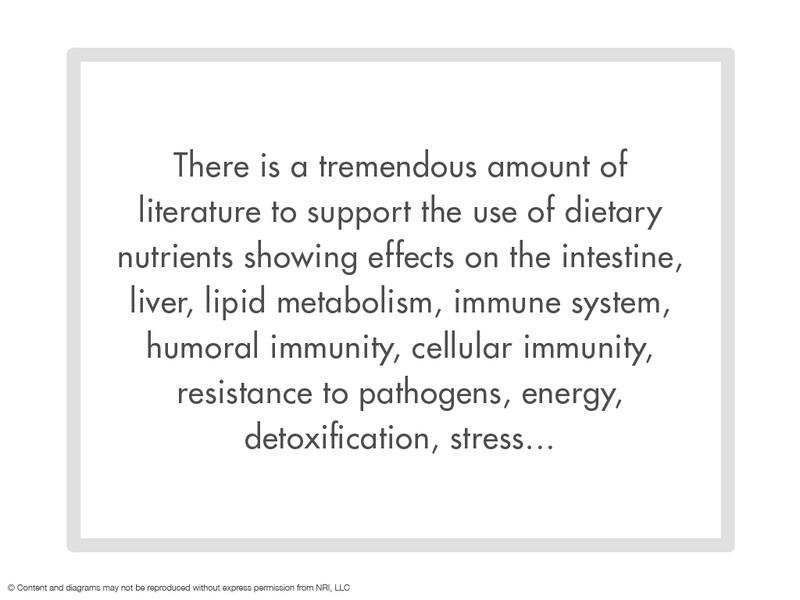 “Dietary nucleotides, considered as antibiotic alternatives, were shown to have positive effects on intestinal hyperaemia, systemic immunity, small intestinal growth and hepatic composition” (Li, 2015). Studies have focused on the protective role of nucleotides with respect to exposure to specific infectious bacterial agents including Streptococcus, Staphylococcus and E.Coli and nucleotide analogues have shown activity against Pseudomonas (Tanaka, 2014). “To test the influence of dietary nucleotide deprivation on resistance to infection, specific nucleotide blends were used in an animal model and then challenged with Staphylococcus aureus. Animals that did not receive nucleotides suffered 100% mortality as compared to nucleotide supplemented animals who “demonstrated significantly greater resistance to this bacterial challenge” (Kulkarni, 1986). In addition, macrophages of the specific nucleotide supplemented group had enhanced phagocytic activity as compared to the unsupplemented group. “Thus, dietary nucleotide restriction increases the mortality from Staphylococcal sepsis. Addition of certain dietary nucleotides appears to decrease this susceptibility to bacterial challenge.” (Kulkarni, 1986). Animal models have also demonstrated that specific nucleotide compositions were able to provide protection against toxigenic strains of E.Coli (Li, 2015). These studies showed increased levels of the probiotic Lactobacillus and decreased levels of E.coli in the groups treated with nucleotides, thus enhancing immunity against a challenge with a toxin producing strain of E.coli. Additional model systems illustrated the positive impact of dietary nucleotides on exposure to Streptococcus (Li 2004). Significantly enhanced survival as observed in the group fed a nucleotide supplemented diet, thus dietary nucleotides positively influenced resistance to Streptococcal infection. Furthermore, the ability of nucleotides to influence the movement of bacteria into the gastrointestinal tract was studied in both gram negative and gram positive strains of bacteria. The movement of both gram negative (ie E.coli) bacteria and gram positive (ie Streptococcus) bacteria into the gut was mitigated by nucleotide support. (Adjei, 1999) Studies by Yu (2002) corroborate the results of Adjei. Benefits of nucleotide addition to infant formula, suggested that the positive impacts of nucleotides on gut integrity may help reduce the risk of invasive bacterial infection in the gut. (Yu, 2002). The bacterium, Helicobacter pylori is responsible for gastric ulcers, duodenal ulcers as well as a range of related gastrointestinal issues. Those with autism tend to have an inordinately high risk for H.pylori and up to 1/3 of adults may also harbor H.pylori. In addition, many with autism and CFS can show increased levels of small bowel inflammation. The use of RNA nucleotides have been shown to aid in healing ulcers. “We conclude that the yeast RNA … accelerated ulcer healing, as indicated by decreased ulcer number and length.” (Sukumar, 1997). These researchers expanded upon these findings demonstrating that “enteral and parenteral supplementation of nucleotides accelerates healing of … ulcers in rats.” (Sukumar, 1999). Similar to the situation with respect to the bacteria, nucleotide supplementation protects against the fungus, Candida albicans infection. Animal models also indicate that “mice maintained on a nucleotide-free diet (NF) exhibit a significantly decreased mean survival time and a significantly increased viable organism recovery in the spleen following intravenous injection of graded inocula of C. albicans compared to mice fed diets containing RNA or uracil as a nucleotide source.” (Fanslow, 1988). Variations of natural nucleotides have been used as antiviral and antibiotic agents. While different than the use of yeast nucleotide blends or RNA, it is worth at least considering that these nucleotide analogues that have antimicrobial activity may hint at similar abilities in unmodified nucleotides, albeit at a lower level than found in modified nucleotides. (Zhou 2006, Shim 2006, Simons 2005, Duong 2009, Vivet-Boudou 2006, Xu 2006, Isono 1991, and Ichikawa 2007). As well as limiting microbial movement into the gut, animal model systems have also shown that nucleotide blends aid in enhancing intestinal recovery after injury. (Adjei, 1996). Previous studies in very young rats have shown that dietary nucleotides improve small intestine repair after injury or malnutrition. Additional studies have investigated the potential impact of nucleotides in old rats, which have a diminished capability for intestinal repair, The positive results of this research suggest that dietary nucleotide intake in the elderly may accelerate the normal physiological intestinal responses. (Ortega, 1995). The use of dietary nucleotide support has also been shown to improve symptoms of Irritable Bowel Syndrome, demonstrating positive results and consistent improvements in most of the symptoms associated with this condition. “Further studies, preferably dose-dependent studies, will need to be carried out to determine the mechanism by which any improvements occur”, it is postulated that “one possible mechanism by which nucleotide supplementation might improve gut function could be via increased mucosal protein” (Dancey, 2006). Nucleotide support has been shown to increase serum IgA levels which are important in the integrity of the gut lining. This increase in IgA along with less experiences with diarrhea was noted in nucleotide supplemented groups as compared to those without support (Yau, 2003). Further studies indicated that lack of nucleotides in the diet resulted in poor growth and development, while the use of nucleotides supported intestinal growth and protection in small bowel transplantation (Ogita, 2002). In multiple studies nucleotides have repeatedly been shown to enhance the growth, differentiation, maturation, repair and recovery of intestinal cells, (Rodriguez, 2010 and Sanderson 1994). An extension of the effects of nucleotides on enhancing growth, differentiation, repair and recovery of intestinal cells is that it may allow for “optimal catch up growth” in individuals with low birth weight or suboptimal growth. (Hu 2014 and Rodriguez-Serrano 2010 and Sanderson 1994). Nucleotides have also been reported to have positive impacts on the kidney and associated issues with renal health. According to recent reviews, “nucleosides, nucleotides and their analogues may also have curative effects on renal disease” (Jacobson, 2006 and Hu, 2014). Furthermore, studies looking at the effect of nucleotides on post-surgical healing found that those using nucleotide supplementation had “better kidney function and remained in the hospital for fewer days than patients who were given the placebo“ (Tepaske, 2001). Animal models looking at the impact of nucleotides on kidney function found that “Oral administration of nucleotides resulted in enhanced … activities in kidney phagocytic cells. This activation of kidney cells was observed for at least 10 days post-treatment.” (Sakai, 2001). Model systems using grafts in the presence or absence of nucleotide support showed significant differences between the two groups. In the absence of nucleotide support there was little gain in body weight and poor development in length, diameter, and wet weight. In addition, the group without nucleotide support illustrated poor villi development, abnormalities in nerve distribution, and degeneration of muscle layer structure in histologic and immunohistochemical studies (Ogita, 2002).Thus lack of nucleotide support can be a factor in degeneration of muscle layers. Conversely nucleotide support can have a positive impact as exercise parameters and heart muscle contractility. Exercise not only has an effect on muscles and cardiac function but can also be perceived as a source of stress and increase cortisol in the system. Stress has been shown to have far reaching effects in the body, ranging from its negative impact on the immune system to increases in cortisol and the fight or flight response. Dietary nucleotides were evaluated for their ability to modulate acute stress responses (Palermo, 2013). After the stressor exposure, dietary nucleotides were able to modulate stress responses, including an attenuation in stressor induced plasma cortisol levels. Additional studies have used highly specific ratios of yeast purified nucleotides to assess their impact on exercise induced IgA and cortisol levels. High level exercise is perceived by the body as a form of stress thus high intensity exercise can be used as a model for stress on the system. The use of nucleotide support was found to help with secretory IgA levels as well as aiding in cortisol balance. “We concluded that a chronically ingested nucleotide supplement blunts the response of the hormones associated with physiological stress.” (McNaughton, 2007). Furthermore, this group was able to show that endurance exercise, as well as short term intensive exercise benefited from nucleotide support. “This work suggests that a nucleotide supplement, given chronically may offset the hormonal response associated with demanding endurance exercise.” (McNaughton, 2006). Strenuous exercise has been associated with immune suppression with an increased risk of upper respiratory infections. Nucleotides were found to help maintain immune function under conditions of stress, and to mitigate the negative impact of bouts of heavy exercise under cold temperature conditions. Supplementation with nucleotides was about to counteract the impairment of immune function after heavy exercise extreme conditions (Riera, 2013). The positive impact of nucleotides was also studied in athletes to assess the impact of dietary nucleotides on exhaustion. The use of nucleotides was found to increase the time before exhaustion set in. The time to exhaustion parameter was significantly higher in the group receiving nucleotides than in the control group (Ostojic, 2013). This may serve as a model system for the use of nucleotide support to offset fatigue in individuals who have health concerns with fatigue. Additional studies have illustrated the positive impact of nucleotides on muscles (Ogita). Precise nucleotide blend ratios have also been shown to reduce markers of cardiac damage and restore heart muscle contractibility as well as increasing the rates of muscle and liver protein synthesis in model systems. Anti-arrhythmic effects and positive impacts on tachycardia have been noted with the use of specific nucleotides (Mason, 1992 and Zehender, 1996 and Zablocki, 2004). Other combinations or nucleotides are reported to improve myocardial and endothelial function after heart transplantation (Szabo, 2006). And yet a third nucleotide support blend plays a role in activation of mitochondrial ATP channels which can prevent ischemic injury and aid in rhythm disorders (Krylova 2006). 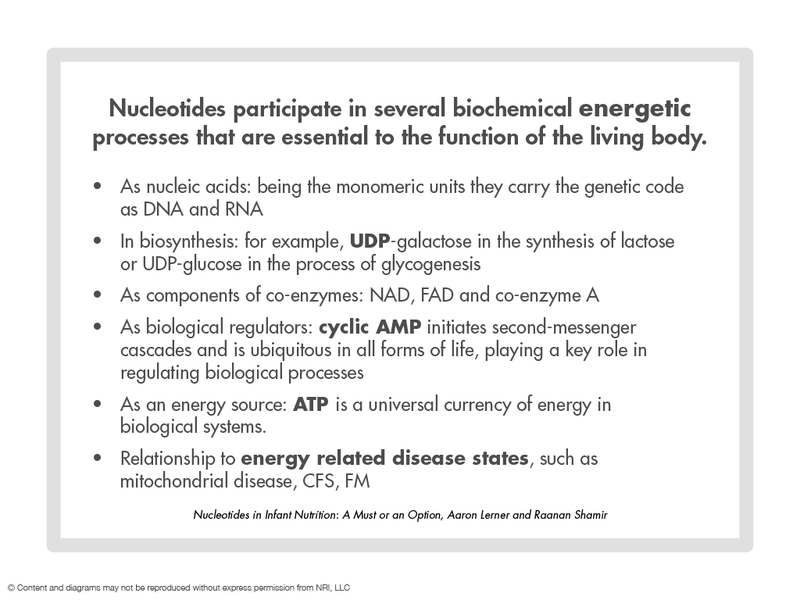 Dietary nucleotide support also allowed for normalizing of mitochondrial enzymes including activity of ATPase, citrate synthase, and malate dehydrogenase which are components of the Krebs energy cycle. (Arnaud, 2003). Collectively “dietary nucleosides and nucleotides may be used as reasonable agents for the prevention of cardiovascular diseases” (Hu, 2014). When plaque buildup blocks the coronary artery it reduces blood flow to the heart muscle causing myocardial ischemia. Injury can occur secondary to this reduced blood flow as well as secondary injury when blood flow returns to the region. This is true for any tissue that experiences damage when the blood supply returns after a period of decreased oxygenation or ischemia. “Nucleotides … may decrease the inflammatory response to ischemia-reperfusion”. (Bastamante, 1994). There may be additional benefits of nucleotide support for those undergoing surgery to address blocked coronary arteries “An immune-boosting nutritional supplement can lower the risk of infection and death in patients undergoing heart surgery, researchers report. … high-risk patients who took a supplement containing … yeast RNA had lower rates of infection and organ dysfunction following coronary artery bypass than those who took an inactive placebo pill” (Tepaske, 2001). Aside from physiological causes of heart problems, for literally decades the negative effects of glutamate on the heart have been recognized. 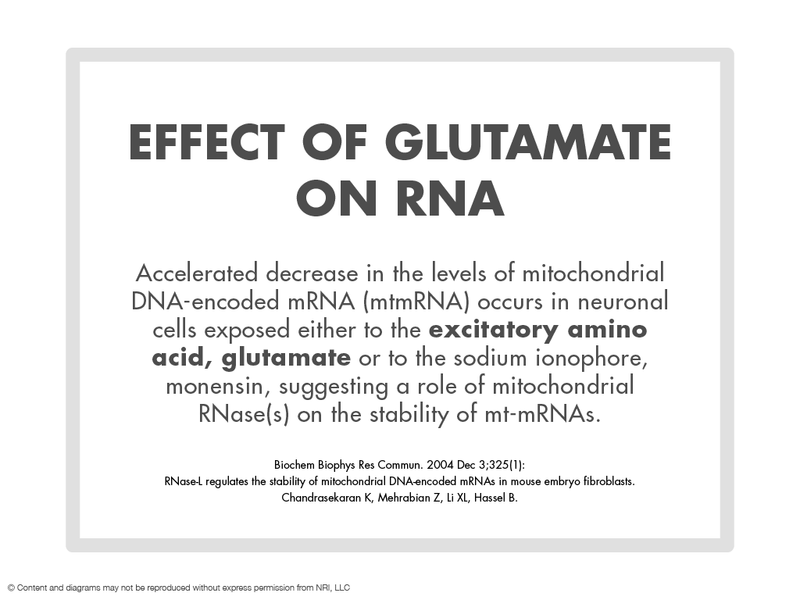 Excessive levels of glutamate relative to gaba can have a range of negative effects in the body, including heart palpitations (Gann, 1977).The first step of the program I have designed to help restore better overall health, is to reduce over excitation of nerves by working on the balance of glutamate and gaba. While some glutamate is needed, too much can excite nerves to death and lead to issues including seizures, twitching, tingling, lack of sleep, heart palpitations amongst other side effects. Nucleotides have been shown to aid in balancing excitability of nerves. Particular combinations have been shown to limit the release of glutamate and aspartate, both of which are known excitotoxins (Corradetti, 1984). In addition, other specific nucleotide blends have protective effects on seizure activity, can act as anticonvulsants and limit over stimulation via NMDA or quinolinic induced seizures. (Schmidt, 2000 and Tort 2004). Oral dosing with specific nucleotides was able to prevent 70% of seizures induced by quinolinic acid; quinolinic acid can be increased with bacterial infection. The results of this study “underscore the therapeutic potential of oral administration of (the nucleotide) guanosine for treating diseases involving glutamatergic excitotoxicity, including epilepsy” (Lara, 2001). Additional research using this model system illustrated that specific nucleotides can mitigate aspects of anxiety related repetitive behaviors (Vinade, 2003). The use of another type of specific nucleotide, uridine, was found to increase GABA levels in the brain, reduce hyperactivity and modulate dopamine neurotransmission (Liu, 2014). While over excitation of nerves is not ideal, lack of glutamate stimulation can be a factor in age related cognitive decline. While nucleotides are able to calm over excitation, they are also able to increase phosphatides and aid in acetylcholine balance in animal models of aging brains (Wang 2007). Slightly different specific nucleotide blends were associated with decreases in age induced deterioration of the brain and limited memory deterioration (Chen 2000). Specific nucleotides are also one of three key nutrients that help to increase the number of new brain neuron synapses throughout the life span (Wurtman, 2014). Nutrients, including specific nucleotides accelerate the formation of the synaptic membrane in infants as well as adults. However, the level of these nucleotides in food sources does not appear to be bioavailable, thus suggesting a need for extra nucleotide support. “In Alzheimer’s disease the need for extra quantities of these nutrients is enhanced, both because their basal plamsa levels may be subnormal and because especially high brain levels are needed for correcting the disease related deficiencies in synaptic membrane and synapses” (Wurtman, 2014). Research indicates that lack of sleep may also play a role in cognitive decline. Studies by Xe and coworkers have elucidated a connection between a lack of sleep in the elderly and the incidence of Alzheimer’s disease. Their data demonstrates decreased clearance of beta amyloid plaque secondary to the negative impact of sleep deprivation (Xie et al., 2013). Normal sleep patterns for infants is also essential for brain development Nucleotides and vitamin B12 are several of the components that have sleep promoting characteristics. “The sleep inducing effects of these components are well established in animal and adult human studies.” In particular, specific nucleotides have been shown to exhibit positive impacts on circadian rhythms. (Arslanoglu, 2012). Melatonin is important for regulating the sleep/awake cycle and melatonin support has been found to help promote sleep. Specific nucleotides have been implicated in melatonin receptor balance, playing a role in the ability of melatonin to be transported into cells. “Guanine nucleotides regulate the affinity of melatonin receptors… The effect of guanine nucleotides and related analogues on the binding of melatonin to membranes … was studied. … These results are consistent with a melatonin receptor existing in an equilibrium between high- and low-affinity states, with GTP and related analogues able to cause a shift in the equilibrium…” (Morgan, 1989). Animal model systems support the concept that nucleotide supplementation may aid in memory and learning. “The learning ability of rats fed the nucleotides-supplemented diet, which was evaluated by the water-filled multiple T-maze test and passive avoidance test, was superior to the rats fed the nucleotides-free diet. The results presented here suggest that dietary nucleotides may influence lipid metabolism of the cerebral cortex and contribute to the rise in learning ability of rats.” (Sato, 1995). Nucleotides have not only shown an impact on tumor cells and the immune system, but also have demonstrated a positive effect on postoperative recovery from surgery to address cancer. “In humans, parenteral solutions with nucleotides given to postoperative cancer patients improved immune function and infectious complications and length of hospital stay was reduced compared to a control group” (Van Buren, 1994). Particular nucleotide blends have also been demonstrated to prevent cell death due to the peroxynitrite (Virag 2001). This compound is known to induce cell death due to oxidative damage. In addition, higher levels of peroxynitrite can be present due to a lack of BH4 or in cases of CFS. Higher levels of peroxynitrite are also implicated in inflammation, reperfusion injury and shock. The results with specific nucleotide blends “may modulate the pattern of cell death during shock, inflammation, and reperfusion injury”. Nucleotides have also been shown to aid liver regeneration after injury; this work has implications for regeneration of the liver following assaults by toxins as a chemical source of liver injury (Norton, 2001). Thioacetamide is a carcinogen and is known to produce liver toxicity in animals exposed to this compound. In experimental models, supplying dietary nucleotides was beneficial in the reversing liver abnormalities after exposure to the carcinogen, thioacetamide. (Leite, 2000). Supplementation also showed protective effects against ethanol induced toxicity in animal model systems (Zhao, 2013). The impact of mycotoxins produced by mold may also be mitigated by nucleotide support. “Mycotoxin levels in the liver of pigs and poultry fed with nucleotide supplemented feed were significantly lower than of animals fed a standard diet, whereas the mycotoxin levels in the faeces of nucleotide fed animals were higher than of standard fed animals” (Koppel, 2003). In part, the ability of nucleotides to limit oxidative damage from a variety of agents may be due to their effect on antioxidant enzymes. In animal models, the use of nucleotides inhibited “the age related decrease in the activities of antioxidant enzymes” specifically inhibiting decreases in glutathione peroxidase (GSH PX) and super oxide dismutase (SOD). Nucleotide treatment also inhibited “age related increases in lipid peroxidation products including malondialdehyde (MDA) in both sexes” (Xu, 2013). MDA is known to be a causative agent in DNA damage and mutations and is a known carcinogen. These studies also found the use of nucleotides to increase life span in animal models. Extended research on the impact of nucleotides on life extension showed decreased spontaneous tumor incidence in both sexes (Xu, 2014). Significant differences were also noted in the occurrence of all malignant and mammary tumors in nucleotide treated females as compared to controls. Death from malignant and systemic tumors was notably decreased in the nucleotide treated groups. This impact on life extension was especially evident in tumor bearing animals, showing a decreased incidence of death from tumors. While the mechanism of action is not known, it is possible that the antioxidant properties of nucleotides may be responsible for the observed increases in life span. A review of older literature on longevity supports the life enhancing properties of nucleotide supplementation (Laign, 1997 and 2003): “Research indicates that nucleotides such as RNA may help to reverse the effects of aging.… supplemental RNA enhances the effects of antioxidants …Other studies indicate that RNA may … play a role in helping … elderly people to avoid illness and remember things more clearly… rats injected weekly with RNA and DNA lived far longer than rats that did not receive the supplements”. Topical nucleotides may also help to restore aging skin, “Topical application of RNA improved cell energy metabolism and therefore the health and appearance of the skin” (Ramirez 1991). Many patients following an RNA regime for years found “diminished skin wrinkling, improved circulation and peripheral nerve function (Laign, 2003). In addition the “RNA was able to increase cellular energy levels so as to facilitate the movement of young cells to the surface where they could replace unsightly senescent cells” (Laign, 2003).